Spend a mid Summer afternoon styling "all things pretty" with interior, food and lifestyle photographer, Tracey Ayton at a West Coast beach house location, near Vancouver, BC. Get Inspired with like minded creatives in this hands on styling workshop. The six hour event gives attendees the opportunity to enjoy a unique and inspiring experience using an impressive amount of styling props, dishes, textiles, food and florals to create their own vignettes. This styling workshop is all about finding your "creative eye" and capturing it on either a camera, smart phone or better yet, both. Tracey's goal for this workshop is to shed some light into what she does in order to create the vignettes that you see in her work. Heavy emphasis is on styling, however, there will be "light" guidance available throughout the day for photography tips to those that want the best chance to capture their creation and need a little boost to get there. Lite bites and refreshments will be available during the workshop and to end the day off, there will be a picnic at the beach. This will give everyone the opportunity to create a beautiful setting together, eat and enjoy the view. *Limited number of seats available. Hi everyone. If you haven’t heard, I will be putting on a styling workshop in a couple of months on location, near Vancouver, BC. Make sure to tune in on this upcoming Monday, February 18th at 9:00 am PST as I will be announcing all of the details that you will need to know with a link as to where you can sign up. I will have the link on all of my social media outlets, including right here on my blog. Hello ~ I hope you all are doing fabulous. It’s been a while since I’ve written, but I thought that this latest opportunity was a great reason to share what I’ve been up to. Recently, I was asked by the lovely people at Anthem to help style a display home at their newest project, The Residences at Ridgeway, for the holidays. It’s been really exciting that since I’ve started photographing homes, food and lifestyle campaigns, lately I’m being more and more recognized for my styling. I’m a firm believer that if you truly enjoy what you’re doing, it will show in your work. And for this project, I got to do the two things I love – photography and styling. 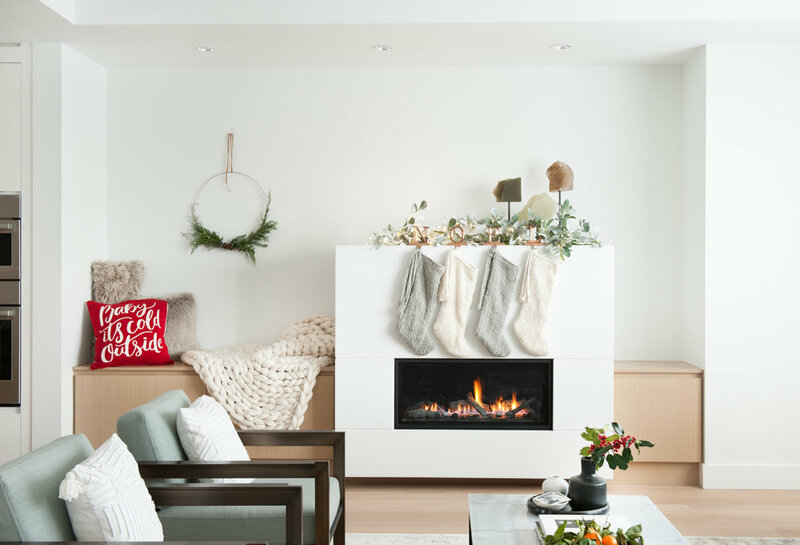 The Residences at Ridgeway is a project of nine single family homes in North Vancouver, and after taking a tour, I knew that I wanted to embrace Scandinavian style and “Hygge” – a Danish word for the cozy feeling you get when you enjoy the simple things in life. Our first step – greenery! Cindy Mast of STOOPS Design helped us out with tasteful touches of nature throughout the home. We wanted to choose greenery that would last for the whole holiday season, so we used lots of eucalyptus, branches and evergreens throughout the inside and outside of the home. And my favourite part, a minimalist Christmas tree in the living room that would make Charlie Brown proud. When it came to decorating the tree, I kept it simple, a few small red baubles for a pop of colour! To finish off the tree we placed the stump in a simple woven basked and placed it atop of a cozy faux fur throw. 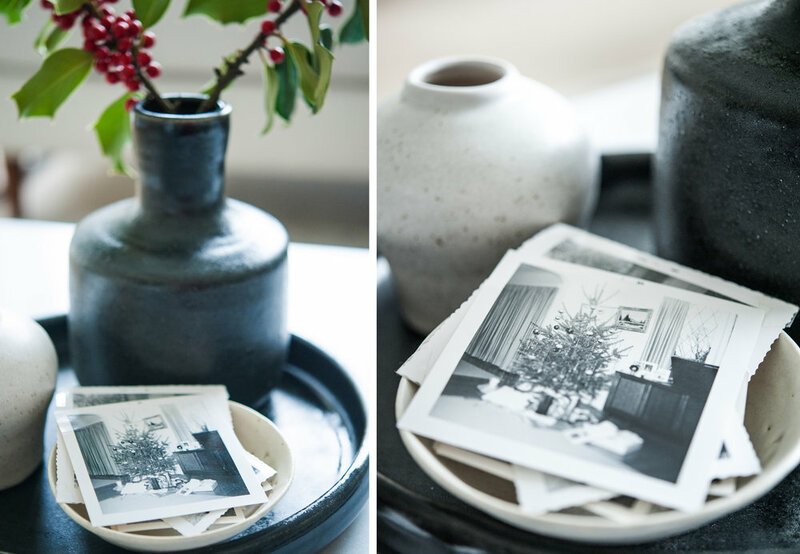 way to share photos for people to sift through and perhaps reminisce of what the holidays looked like way back when. We saw the family room as a place where the kids could have their own Christmas tree to decorate – a slightly smaller tree than the one in the living room. To create a whimsical, kid-friendly space we found beaded, string garland and adorable felt mice, known as “Woodland Creatures,” from The Cross Décor + Design. For a fun, crafty project we created an oversized ball of yarn and placed it on the book shelf. It was made from a large Styrofoam ball which I wrapped thick yarn around! My favourite part of a home is always the kitchen, and the big island and high-end kitchen appliances at The Residences at Ridgeway were the perfect backdrop for my “lived-in” look. 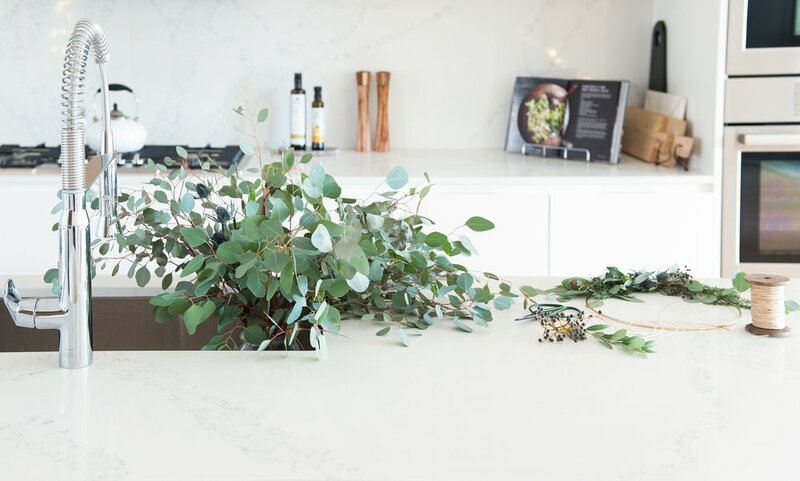 I placed an oversized bunch of eucalyptus on one side of the double sink, and on the counter, I placed a pair of vintage style clippers and some sprigs of greenery. Making it look as if someone was in the middle of creating a holiday wreath – which is super easy I may add. All you need is a simple gold hoop, fresh greenery and a wire. You can even forage for the greenery in your own back yard. It truly was an honour to work on this project. It means the world to me to have been recognized for my styling and photography. A huge thank you to the folks at Anthem for bringing me onto such an amazing project. I do hope that everyone enjoys it as much as I did styling and photographing it. 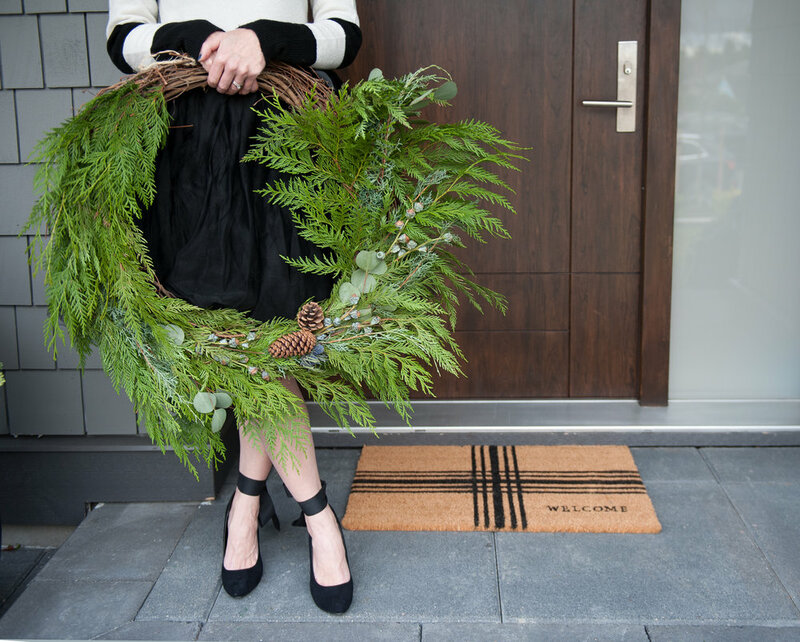 You can see all my holiday styling in person at The Residences at Ridgeway. The display home is open the next two weekends from 12-4pm. Located at 436 East 5th Street, North Vancouver. My dog Frankie, who tested out the mudroom/puppy area for us and ensured it was dog approved! And if you want to know where we got all our great decorations from check out The Cross Décor + Design, HomeSense, Michaels and Chapters Indigo!